We’d love your help. Let us know what’s wrong with this preview of The 7 Habits of Highly Effective Families by Stephen R. Covey. To ask other readers questions about The 7 Habits of Highly Effective Families, please sign up. is this a good book to read together with a child of around 12 years old? I didn't expect to like this book as I have a hefty mental block against self-help books. An earlier occupant of my office had left it on the shelf and I eyed it with contempt for years before curiosity finally drove me to flip through the pages. And wham! I suddenly realized all the hype around Stephen Covey wasn't just hype. He is one of those rare people -- I have known two or three in my life -- with the facility of clear thinking, who intuitively understand cause and effect, and therefore a I didn't expect to like this book as I have a hefty mental block against self-help books. An earlier occupant of my office had left it on the shelf and I eyed it with contempt for years before curiosity finally drove me to flip through the pages. And wham! I suddenly realized all the hype around Stephen Covey wasn't just hype. He is one of those rare people -- I have known two or three in my life -- with the facility of clear thinking, who intuitively understand cause and effect, and therefore act in such a way as to produce the desired outcome. Why can't the rest of humankind do this? I really don't know. Once we have it pointed out to us, we see it; but there is a kind of fog around our brains that prevents us seeing it on our own. Why else are there so many frustrated people, so many unhappy families? it's not because we want to hurt ourselves and those around us, it's because we don't understand how to 'begin with the end in mind', to think clearly about where we want to go and chalk out our flight plan to get there. 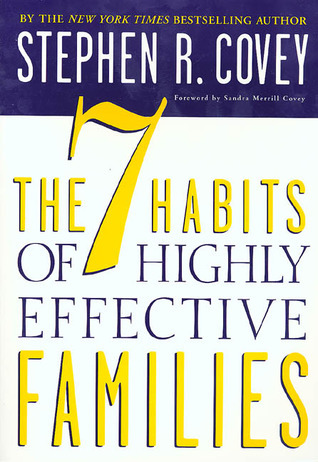 Written using the same principles that were introduced in the bestselling "The Seven Habits of Highly Effective People," Stephen Covey applies The Seven Habits to the family using personal, family, and others' experiences to illustrate each concept. Every chapter includes ways to apply the principles in the family, and ways to teach the principles to your family. I've only read a chapter or two of the first Seven Habits book, and so I enjoyed not only learning about the Seven Habits, but how the Written using the same principles that were introduced in the bestselling "The Seven Habits of Highly Effective People," Stephen Covey applies The Seven Habits to the family using personal, family, and others' experiences to illustrate each concept. Every chapter includes ways to apply the principles in the family, and ways to teach the principles to your family. I've only read a chapter or two of the first Seven Habits book, and so I enjoyed not only learning about the Seven Habits, but how they apply to the family. Like any program, the Seven Habits takes time and application, and then patience to see results, but the Seven Habits are grounded in truths that will help anyone or any family have better relationships and be more successful in life. I loved the illustrating stories and the personal insights that Dr. Covey, his wife, his family, and others shared to help the reader learn how to apply the principles. I highly recommend this book to anyone who wants ideas on how to improve family relationships and create a beautiful family culture. I’ve resisted the Stephen Covey bandwagon: his particular presentation doesn’t appeal to me. His books – to me – read a bit too much like tracts. And the sappy stories and drawings kind of freak me out. I have an overall sense that he is restraining his desire to preach, to lead me to salvation, to shout ‘AMEN!’ But I won’t for one single second deny that he has an unusual insight and wisdom pertaining to success and purpose. So I read The Seven Habits for Families. There is a lot in here. So mu I’ve resisted the Stephen Covey bandwagon: his particular presentation doesn’t appeal to me. His books – to me – read a bit too much like tracts. And the sappy stories and drawings kind of freak me out. I have an overall sense that he is restraining his desire to preach, to lead me to salvation, to shout ‘AMEN!’ But I won’t for one single second deny that he has an unusual insight and wisdom pertaining to success and purpose. So I read The Seven Habits for Families. There is a lot in here. So much so that I think this is almost better used as a reference book – something to page through every now and then to mull over for a few days. From my vantage the real value of the book comes in the first few chapters when Covey explores the stimulus-pause-response cycle. Something happens – a child breaks a vase or a dad gets a bonus and we have an inclination to act. Act now. To be in the moment, so to speak. Covey takes some pages to show that this space between action and response is where we are able to direct our futures. Our decisions about how to respond set up our future circumstances. It’s a cycle that we can use to point our lives in a direction of our choosing. Through the rest of the book he focuses on the Seven Habits with applications for families: priorities, relationships, family and personal growth. He spends a good amount of time on the family business plan: putting together a real document that outlines a family’s core principles, priorities, and goals. Take this with a grain of salt and adjust it to your family situation. Other reviewers point out that a family is not a business or a sports team. True enough. But the truism sums it up: it’s easy to get there when you don’t know where you are going. The family plan is an opportunity to talk about what is important and to set common goals. Nothing has to be written in stone. Real business plans certainly aren’t. They set goals and develop plans for how to reach them and then, at regular intervals, assess how they are doing and make requisite changes. I was impressed that Covey stresses that this is not something that is to be churned out in a weekend by dad – it’s not a rule book. He cautions that everyone in the family must be able to take the time they need to think hard about how they and their desires fit into the family. It’s clear to me that the plan is well in play when you simply start thinking about it. The book settles nicely into Covey’s folksy, ah shucks writing style. It’s easy to read and easy to digest. Some will call it wishful thinking – this is the new millennium after all. Families look different, entertainment looks different, you can have an electronic pet if you prefer. But I think Covey would say that we still want the same thing: parents want their children to grow up to be kind and respectful. We want to enjoy meaningful time with our family and friends. Children want to be understood and listened to. Though the times change human nature remains the same. People come to these kinds of books with different expectations. For some the book will provide a few useful tips for navigating your family toward a known goal. Others will find it a godsend of wisdom. I find it hard to imagine a family that couldn’t benefit from a reading of the Habits for Families. I read this as an audiobook which turned out to be a mistake. It's just too hard to absorb the ideas when you are driving, and I wanted to make notes and had to settle for voice memos. When I do a reread, as I should, I will read the paper or e-version. That said, it was a sound book with a lot of good suggestions. We are actively working on our family dynamics so that we can bring our a-game in anticipation of another child, and this book gave my husband and I a lot of good talking points. I thi I read this as an audiobook which turned out to be a mistake. It's just too hard to absorb the ideas when you are driving, and I wanted to make notes and had to settle for voice memos. When I do a reread, as I should, I will read the paper or e-version. That said, it was a sound book with a lot of good suggestions. We are actively working on our family dynamics so that we can bring our a-game in anticipation of another child, and this book gave my husband and I a lot of good talking points. I think that's the key to any self-help book like this: you're not going to change just from reading them, but you'll walk away with ideas and things to discuss with your partner, and that's where the change slowly seeps in. See, even "change" is too strong a word because it implies a problem, and you don't need to have a problem to get something from this book. It's more like adding a weight-lifting program to your fitness regime so that you can tone existing muscles. This helps you tone your family structure. Ok yes, this sounds cheesetastic, and no, we haven't done it yet, BUT it is an interesting discussion to talk about what you each think your family's core mission is. Why are you a family unit? What are you hoping to achieve? Your family is first and should be a top priority. Really, actually schedule it on the calendar and treat it like a business meeting. The time is filled, you can't schedule anything else there. This is such a great suggestion, and one we've already put into practice. I had to turn down a fun invitation this Friday because I'd already committed to a storytime with my son. It was on the calendar, so I had that time blocked out for him, and I knew it was a priority for us. Boy, isn't this life with a toddler? Every day we try to give him choices (so he feels independent) that we can live with (so we get what we need too). It seems that this extends into older children and family life. I loved this one. One thing Covey said that I had to record was that when you love someone, you must love the things they love as much as you love the person themself to truly accept that person. Find a way to foster family unity through differences, not in spite of. I really liked 7 Habits of Highly Effective People, and in the context of families it makes even more sense. 1: Use your agency/be proactive. Use the pause button to use 4 gifts. 2: Begin with the end in mind (personal, spouse, family motto/creed). 3: Put first things first (one-on-one time, family nights). 4. Seek first to understand, then to be understood. Husband's comment: Covey is a genius. He has taken certain practices/principles of the LDS I really liked 7 Habits of Highly Effective People, and in the context of families it makes even more sense. Husband's comment: Covey is a genius. He has taken certain practices/principles of the LDS church and made them available to a general audience and made a fortune. Getting through this book was very difficult for me. Not because the content was bad, just because it was very...dense. (Also because I'm bad at reading.) If I was reading very meticulously as I am wont to do, I could only manage a couple pages before my brain was saturated. I think, honestly, it could've done with quite a few less stories and examples, and there were definitely times I felt like though something was quite interesting, it wasn't really necessary. You can tell the guy is very well-learned and...maybe wants to show it. Nevertheless it was all quite fascinating. The content was really quite good in my opinion, though I'm not quite sure how to describe it. It isn't exactly a 7 step system as one would assume, as those are pretty straightforward. It's more like... 7 methodologies for living? Almost like, psychological principles. It is definitely very wholesome which I appreciate. He covers the importance of spiritual, social-emotional, physical/economic, and mental aspects of life and their importance. He covers modeling and mentoring. Empathetic LISTENING. Creating a win-win situation instead of the win-lose our culture seems to follow. Making the important (not urgent) a priority in our life. I would definitely recommend this book to anyone that is a part of a family, wants to have a family, or interacts with people. So basically, everyone. My only hesitation is just the length and density. I know there are abridged versions and cliff notes, those might be able to capture the essential methodologies so if you can't make it through the book, try those. Definitely worth having in your tool bag. I liked the overall message in this, but with me being such a raging cynic, I struggled with execution. I listened to the audio and it turned me off. It felt like a "let's hold hands - kumbaya fest". I don't know what it is, but that kind of thing gets my hackles up. However, in spite of the cynic within, I did find that this book has some practical applications for strengthening families and how to keep things on a positive note. Keeping the end result in mind, was something I wholeheartedly ag I liked the overall message in this, but with me being such a raging cynic, I struggled with execution. I listened to the audio and it turned me off. It felt like a "let's hold hands - kumbaya fest". I don't know what it is, but that kind of thing gets my hackles up. The 7 Habits are the same, don't change. He just adapts the concepts to family life. The idea is to build a Highly effective family culture. I really enjoyed it and found some great concepts to implement at home right away. Excellent! This is the book that inspired us to write our family mission statement. Everyone who is a member of a family should read this book (so that means everyone 😉). Stephen Covey takes the 7 Habits from “The 7 Habits of Highly Effective People” and teaches how they work within a family setting. He provides many different examples, stories, objects lessons, and facts to support and teach each Habit. I feel like this book is so full of good information it will be something that I need to continually come back and reference to. It’s more of a way of life then a book with a f Everyone who is a member of a family should read this book (so that means everyone 😉). Stephen Covey takes the 7 Habits from “The 7 Habits of Highly Effective People” and teaches how they work within a family setting. He provides many different examples, stories, objects lessons, and facts to support and teach each Habit. I feel like this book is so full of good information it will be something that I need to continually come back and reference to. It’s more of a way of life then a book with a few good takeaways. I'm very impressed with this book and anticipate that it will have a positive impact on the culture of my young family. I purchased the book after having a discussion with my husband about family mission statements. Our son was a year old at the time, and we felt compelled to approach our young family with deliberateness and intentionality. Every other endeavor in our lives had come after research, or it came with instructions. We feared that if we just free-styled family life then in thirty yea I'm very impressed with this book and anticipate that it will have a positive impact on the culture of my young family. I purchased the book after having a discussion with my husband about family mission statements. Our son was a year old at the time, and we felt compelled to approach our young family with deliberateness and intentionality. Every other endeavor in our lives had come after research, or it came with instructions. We feared that if we just free-styled family life then in thirty years we'd be left with regret and wondering how the hell we got there. Perhaps we'd also have a few good reports that things had "turned out" okay, but accidental results aren't always good. This book has excellent principles which when put to use will empower a family to operate as a body (where the whole is greater than the sum of its parts, kind of thing), and have the strength to weather all the unexpected problems it will no doubt face. I've underlined a lot on the pages, and am excited for my husband to read it, too. Mostly I'm excited for when we sit down and write our Family Mission Statement which will determine the culture in which our children live. Covey targeted several troubled areas families face having children, and, or struggles with personal growth and positive productively with focus on ideas of mediated hope, inspiration, and faith pursuing all that which is granted to those who strive for healthy relationships. These techniques Covey suggests, trains the brain to activate emotions of empathy, honor, sincerity, significance, straightforwardness that is rooting in the heart of us to release; awareness, ease and flow of reasonable un Covey targeted several troubled areas families face having children, and, or struggles with personal growth and positive productively with focus on ideas of mediated hope, inspiration, and faith pursuing all that which is granted to those who strive for healthy relationships. These techniques Covey suggests, trains the brain to activate emotions of empathy, honor, sincerity, significance, straightforwardness that is rooting in the heart of us to release; awareness, ease and flow of reasonable understanding, compassion and love towards our loved ones. A task that takes little effort, and plenty rewards. I recommend this book for prospective parents, parents, guardians, caretakers of children, or anyone who cares enough about our young people who may struggle with peer pressure, abuse, self identify, drugs, alcohol, unruly behavior, rebelliousness, and other obstacles that can obstruct them from becoming productive members of self first. This book took me a while to read because I took extensive notes, which I do not normally do. Covey's 7 Habits as applied to families seek to promote what Covey calls "a beautiful family culture." The author points out that these habits can be applied to any family at any stage of life. To summarize, the 7 habits are as follows: (1) Be proactive rather than reactive; (2) Establish a written family mission statement and written family values; (3) Make family your top priority; (4) Try to create " This book took me a while to read because I took extensive notes, which I do not normally do. Covey's 7 Habits as applied to families seek to promote what Covey calls "a beautiful family culture." The author points out that these habits can be applied to any family at any stage of life. To summarize, the 7 habits are as follows: (1) Be proactive rather than reactive; (2) Establish a written family mission statement and written family values; (3) Make family your top priority; (4) Try to create "win-win" scenarios; (5) Seek first to understand, then to be understood; (6) "Synergize", or put all of these together; and (7) "Sharpen the saw", or continually renew yourself and your family physically, mentally, socially, and emotionally. I think the book has some really good information in it and lots of helpful stories. However, for me, the material wasn't fresh new material, therefore it was a little harder for me to get through the whole book. I felt like it beat a dead horse on most topics and could have been cut down from the 360+ pages (large ones too) to half that. However, in the books defense, I had previously read parts and pieces of the book, which helped make the material less useful. Also, I believe Dale Carnegies b I think the book has some really good information in it and lots of helpful stories. However, for me, the material wasn't fresh new material, therefore it was a little harder for me to get through the whole book. I felt like it beat a dead horse on most topics and could have been cut down from the 360+ pages (large ones too) to half that. However, in the books defense, I had previously read parts and pieces of the book, which helped make the material less useful. Also, I believe Dale Carnegies book covers much of the same material in far fewer words. Even though I've had a lot of guides on how to raise a family correctly, this book gives specific ideas and slightly different concepts that really changed my way of viewing family relationships. I definitely want the type of family he describes and am excited to start a plan with my hubby to make it happen. I loved all the anecdotes and experiences included in the book (written by his children and other people who embraced the 7 Habits). To me they give specific examples of how I can apply the Even though I've had a lot of guides on how to raise a family correctly, this book gives specific ideas and slightly different concepts that really changed my way of viewing family relationships. I definitely want the type of family he describes and am excited to start a plan with my hubby to make it happen. I loved all the anecdotes and experiences included in the book (written by his children and other people who embraced the 7 Habits). To me they give specific examples of how I can apply the 7 habits in my life...which is often lacking in self-help books that are too general. I recommend that every person who is part of a family read this book!! The things that stands out to me the most in this book is the bit written by Covey's wife, talking about finally "getting" what is important about family life as she is breastfeeding their 8th child, and examples of how they addressed various family crises and decisions with their kids. They must have been so busy, with 8 kids and him on the road, yet they kept in mind the importance of balance between family, me time, their marriage and his career. Really liked the toolkit as he explains for what The things that stands out to me the most in this book is the bit written by Covey's wife, talking about finally "getting" what is important about family life as she is breastfeeding their 8th child, and examples of how they addressed various family crises and decisions with their kids. Really liked the toolkit as he explains for what worked for them and how to apply it. The "family meetings" are a good concept in theory but would be difficult / ? not so effective for single parents (especially those with ex-partners uninterested in co-parenting) and withing small families. But in terms of laying out a formula for maintaining balance within the busy-ness of family life, well worth a read and to refer back to. This book is so worth reading. I loved it. Stephen R. Covey makes a good argument for taking courage to change important things in our lives, and gives great direction in how to implement his 7 habits. If you've also read his other 7 Habits book, don't be deceived into thinking you know all there is to know about the subject. This book takes a different approach and is very much focused on the family. However, it takes the commitment of an individual to make a change. This book is not for the fa This book is so worth reading. I loved it. Stephen R. Covey makes a good argument for taking courage to change important things in our lives, and gives great direction in how to implement his 7 habits. If you've also read his other 7 Habits book, don't be deceived into thinking you know all there is to know about the subject. This book takes a different approach and is very much focused on the family. However, it takes the commitment of an individual to make a change. Like a step by step strength training for families that we can adapt and grow with as our family changes. love the teen and kid versions too. Opens good conversations with our children, so we can all grow a healthy family together. Recommends it for: nobody, ever. It only took me two years to finish this book since I got stuck on page 97. But once I started reading again in late June 2014; I understood WHY this book and Stephen Covey's more notable one, The 7 Habits of Highly Effective People, is well-cited in business and parenting circles. Covey's principles are applicable today. This is not a light read but this will be a reference I will definitely return to time and time again. For those who read The 7 habits for highly effective people, this is much more extracted version for members in family. The book is full of different stories and examples, which for some reason was killing the wonderful experience I got from "People" book. Yet Stephen R. Covey is one of the best authors in this area of human development globally. I hope if Covey could create much more briefed version! 7 Habits of Highly Effective families follows the same principals as the Highly Effective people. I think it's a great book even if you read it as a refresher motivator to keep your home life functional and happy.